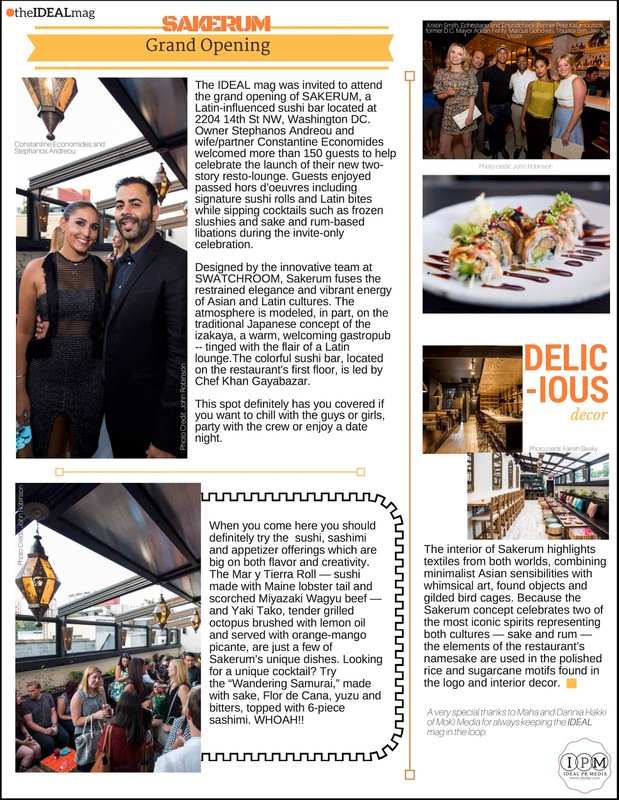 The IDEAL mag was invited to attend the grand opening of SAKERUM, a Latin-influenced sushi bar located at 2204 14th St NW, Washington DC.Owner Stephanos Andreou and wife/partner Constantine Economides welcomed more than 150 guests to help celebrate the launch of their new two-story resto-lounge. Guests enjoyed passed hors d’oeuvres including signature sushi rolls and Latin bites while sipping cocktails such as frozen slushies and sake and rum-based libations during the invite-only celebration. Designed by the innovative team at SWATCHROOM, Sakerum fuses the restrained elegance and vibrant energy of Asian and Latin cultures. The atmosphere is modeled, in part, on the traditional Japanese concept of the izakaya, a warm, welcoming gastropub -- tinged with the flair of a Latin lounge.The colorful sushi bar, located on the restaurant's first floor, is led by Chef Khan Gayabazar. This spot definitely has you covered if you want to chill with the guys or girls, party with the crew or enjoy a date night. When you come here you should definitely try the sushi, sashimi and appetizer offerings which are big on both flavor and creativity. The Mar y Tierra Roll — sushi made with Maine lobster tail and scorched Miyazaki Wagyu beef — and Yaki Tako, tender grilled octopus brushed with lemon oil and served with orange-mango picante, are just a few of Sakerum’s unique dishes. Looking for a unique cocktail? Try the “Wandering Samurai,” made with sake, Flor de Cana, yuzu and bitters, topped with 6-piece sashimi. WHOAH! The interior of Sakerum highlights textiles from both worlds, combining minimalist Asian sensibilities with whimsical art, found objects and gilded bird cages. Because the Sakerum concept celebrates two of the most iconic spirits representing both cultures — sake and rum — the elements of the restaurant’s namesake are used in the polished rice and sugarcane motifs found in the logo and interior decor. Be sure to add this to your list of places to try very soon!